This is our second Hallowe’en in the new house, which means that this time around, we knew where the bins of holiday decor were, the living room wasn’t filled with unpacked boxes, and it was easier to get into a ‘holiday’ state of mind. 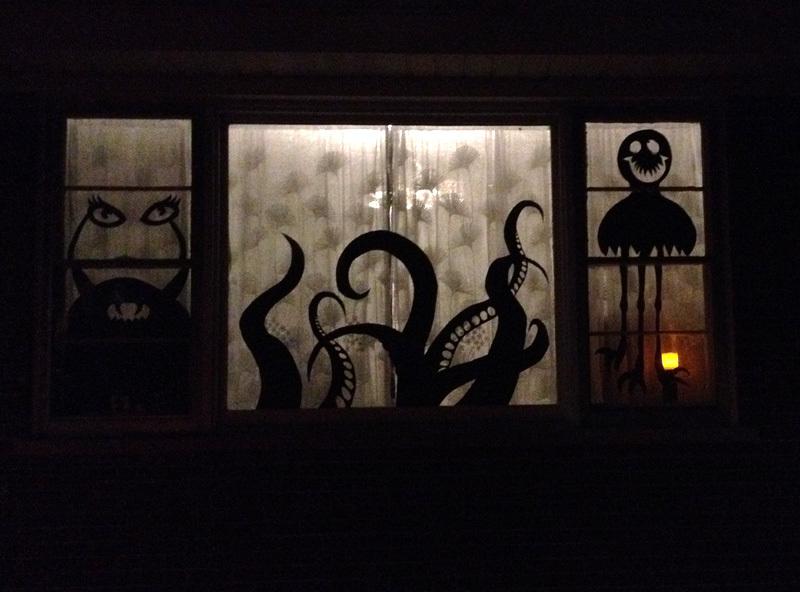 Since this is my husband’s favourite time of year, I try to go big, adding a few new things every year, and generally spookifying up the place, and this year he chipped in, helping me do our front windows. Held hostage by monsters. Please send candy. Some people buy Styrofoam grave markers and plastic body parts and scatter them on the front lawn, others drape polyester spiderwebbing all over their hedges. 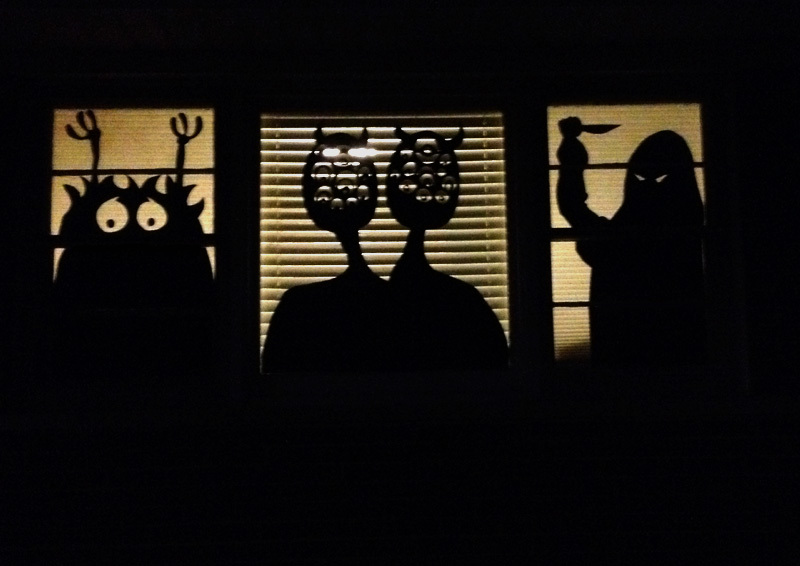 We go simpler, and spookier, creating a houseful of monsters, aliens, serpents and fiends, covering the front windows of the house, lighting them from behind, and then turning off any outside lights so that the house is pitch black, except for the glow of the windows, illuminating the horrors within. This is my favourite thing to do all year, holiday-wise. We have already had a total stranger stop and knock on the door just to tell us how much she loved the octopus, and while we were finishing up the fiend and the 22-eyed monster in the kitchen, some neighbourhood kids stood on the lawn, alternately giving us the thumbs-up and pretending to be zombies, which I believe are the two highest compliments a little boy can give. It’s creepy and weird looking, and people stop and take pictures, or stop and laugh, and it is kind of funny to be cooking dinner and hear someone out on the front sidewalk talking about them. Could you pass me that knife, please? I have got a lot of Julienning to do! Five dollars-worth of black construction paper, two pairs of scissors, and two rolls of transparent tape. And a lifetime of watching old horror movies, of course. That is all it takes to transform a boring little bungalow to a house of horrors. I can’t even get over how much this silly little craft delights me, or how thrilled my girls were to come home from school to find the house ‘filled’ with monsters. Today is a day off for our school district, so the kids are home, ready to be put to work pulling pumpkin guts out of pumpkins [ed note: euw! so cold! so slimy!] 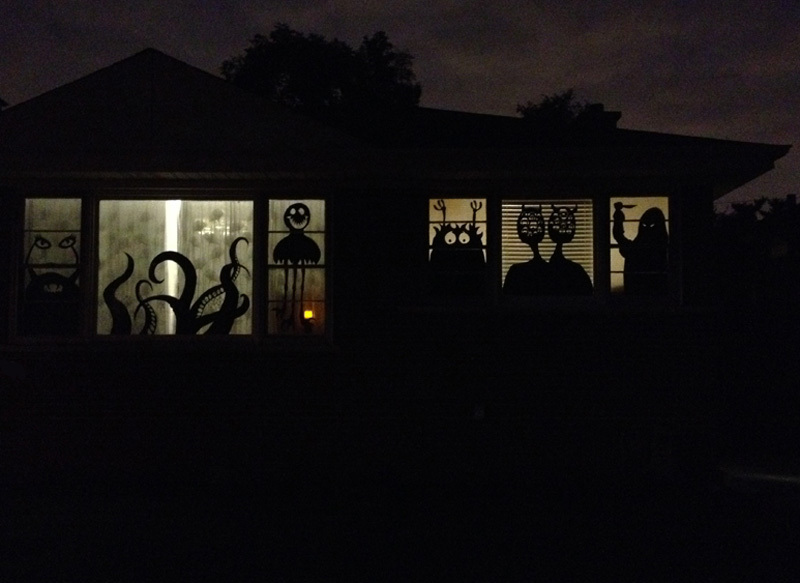 so that we can add some pumpkins in the garden down below, but for now, we are sticking with monster minimalist. And I like it.